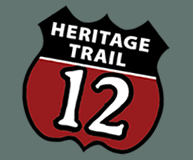 The mission of the US-12 Heritage Trail Council is to promote, educate and coordinate programs and projects aimed at preserving the heritage and natural and cultural resources of the US-12 corridor. To accomplish this mission, the US-12 Heritage Trail Council has developed and adopted the following goals. These broad-level corridor goals are intended to provide the basis for the development of a future management plan and ultimately the framework for the development and implementation of projects and programs along the US-12 Heritage Trail. Goals of the US-12 Heritage Trail. This page last updated on 8/9/2018.